The corporate world is changing at an accelerated pace. There is a real tension between adopting the tried and tested principles of the “old world” (twenty years ago) epitomised by Nebraska’s sage, Warren Buffet, and the “new world” of innovation and disruption, adopted by the likes of Google, Apple and, more recently, Uber. I am fairly certain that many very clever, business sages believed Travis Kalanick and Garrett Camp to be “off their rockers” when they started Uber in 2009 (a mere 6 years ago). Today, Uber is the highest valued start-up in the world. So, we have a fantastic dilemma; how much attention do we give to the “old” versus “new” world? It fascinates me when great business leaders from the last decade passionately argue that the “tried & tested” formulas that ensured their success are the only keys to future success. No doubt, there are business fundamentals that will never change. Some refer to this as the “Warren Buffet syndrome”. However, over the past few decades, the world has become a radically different place. The corporate garbage heap is replete with the “Kodak” story. Accenture and other dynamic companies have done away with the annual Performance Review Process and I recently heard that Discovery and Telesure have discarded leave policies for their senior executives. The underlying logic is that executives are running sizable businesses with aggressive targets. If one needs to take leave, it is at his/her discretion. Another beautiful tension is in leadership / management styles. There is tension between granting employees autonomy versus a more rigid control style. The ability to leverage the Human Capital and build a high performing culture is one of the greatest strategic levers. The “X” “Y” & “Z” generation are different to the “baby boomers”. Considering this, should executives manage or lead differently? It is a real balancing act to strike the right equilibrium between managing with a high degree of control, whilst still allowing self-expression, autonomy and independence. The human spirit thrives on autonomy and independence but, there will be high risk without oversight, parameters and guidelines. On the other hand, too much control and micro-management will quickly stifle and suffocate valuable talent. Great leaders work with this dynamic tension all the time. The goal of leadership is to constantly marry the two factors of autonomy and control in a “yin yang” relationship, depending on a range of constantly changing factors that optimise sustainable performance. Combinations of the two could vary from high autonomy and high control to low autonomy and low control with various permutations between the two extremes. There is no ideal balance, the tensions are dynamic, and as the internal or external environment adjusts, the combination should change. The Autonomy and Control Interdependence Model below, suggests a graphic representation of this dynamic tension. 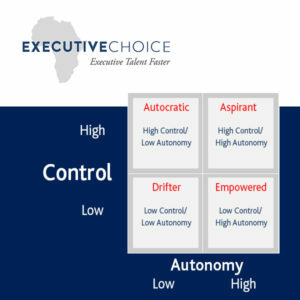 The top left quadrant reflects an autocratic type of management style, reflecting high control with managers restricting autonomy. This management style was typical in the “old world”. It adopts a rigid hierarchical structure with highly regulated processes, policies and procedures. Micro-management and direct control methods would be implemented, probably stifling innovation. It is highly improbable for employees to contribute any discretionary effort. Consequently, this managerial style is not broadly sustainable. The bottom left quadrant is characterised by managers that are drifters. This approach depicts a disinterested, casual and disengaged management style, characterised by low control as well as low autonomy. This management approach contains little benefits for both employees and companies. Organisations that foster this type of management culture are unlikely to be successful. The bottom right quadrant portrays an empowered style, characterised by high levels of autonomy with low levels of control. Employees are granted high levels of freedom to be creative and innovative and are expected to have high levels of self-management to drive organisational performance. One drawback is the low levels of consistency and standardisation across the organisation which could impact a broad range of stakeholders. 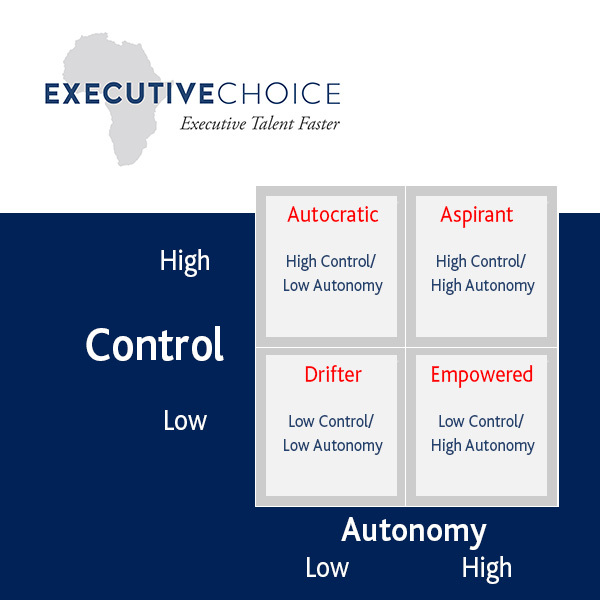 The top right quadrant reflects the high control and high autonomy combination, termed the aspirant manager. In this paradoxical relationship, management are able to retain control whilst employees are engaged, focused and motivated. In this quadrant, control is indirect. It presents itself through a strong culture, values and guidelines that do not engender the negativity commonly associated with direct control. Indirect control provides the critical oversight and monitoring which allows for the effective managing of risk whilst co-ordination across the organisation is also achieved. Employees benefit by enjoying autonomy within pre-determined deliberate guidelines. Do you struggle with the leading and managing with Autonomy and Control? Where are you on the model?